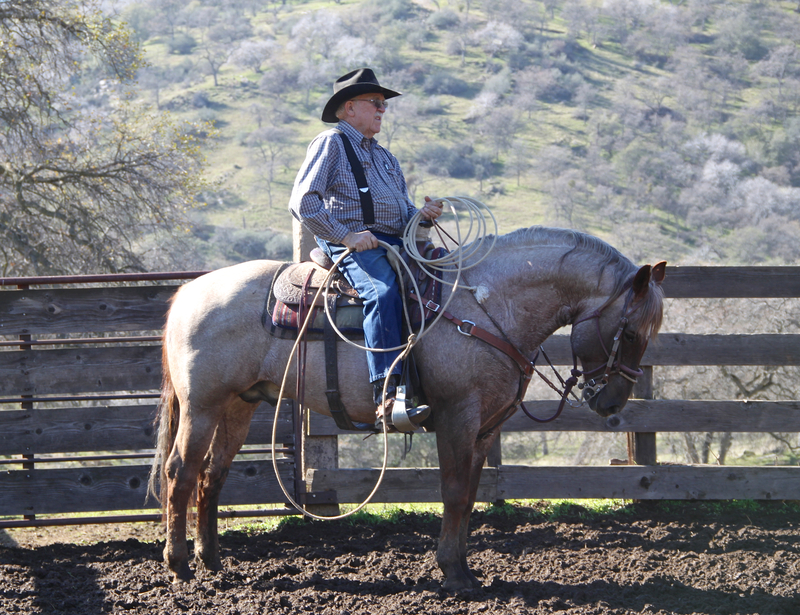 It’s nearly impossible to discuss the Greasy Creek watershed, or even the history of Dry Creek, without mentioning longtime cowman, Earl McKee. Going four-score strong, he’s been my neighbor for over forty years as well as a surrogate father from time to time. 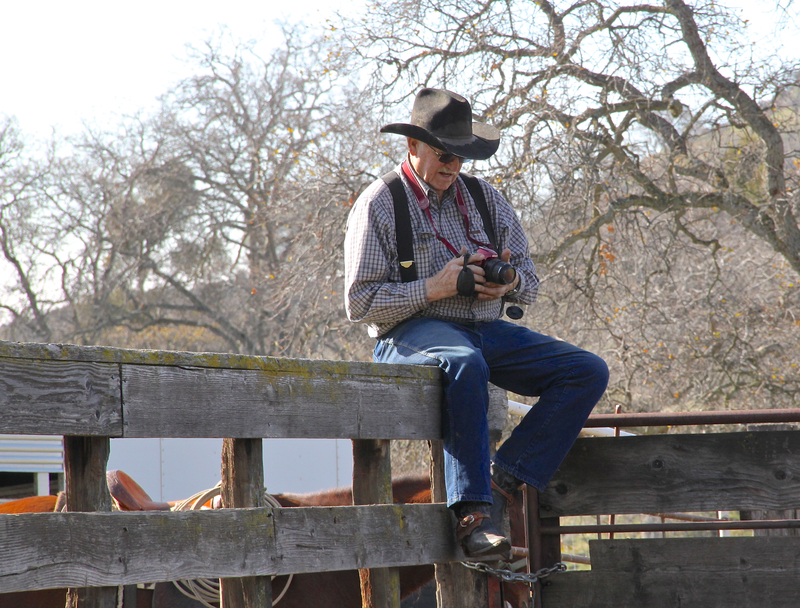 Among his many activities, like playing the tuba in the well-traveled High Sierra Jazz Band, he’s been photographing brandings for many years now, focusing on the lariat loop. In coming days, we will be sharing some of these. like cattle in these many shades of gray. to haunt our most pastoral dreams. rewarmed, quiet on your fork. the wilds, our gods, the fickle muse? to hold more than refrains from birds? Preserving the remnants while I stitch new days. As usual, I’ll be following the Thread. clean and ready, with some life left in Kauai. what seems to have gotten away from most. I awoke this morning telling myself that we mustn’t forget the landmarks, those places where the memories are held, so that when we pass by them, our stories are triggered, remembered and retold. And if as proof, when they are removed to accommodate some notion of progress, the stories and history of a place become easily forgotten. Whether truly one of the muses or just a phenomenon of living in a place for a long time may be an academic question, but I remember my feeling of personal loss when a portion of the Sycamore Alluvial Woodland on Dry Creek was felled for a rock and gravel operation—that place I walked along the creek, Easter Break on my birthday in 1969, contemplating Canada or Viet Nam; that place I roped my first cow to doctor by myself; that place I played and swam with my sister and brother, catching and bringing tadpoles home in a bucket to watch grow legs to become bullfrogs. It’s such a short leap for me to feel the spirits of this place where I’ve spent my life, goddesses, muses or past lives seeking a voice, triggered by certain rock piles and oak trees, especially among the evidence of old homesteads and native habitation well before me, all waiting around every corner of this ranch to enrich my history, my sense of place. Logically, landmarks come with the landscape, and it could be argued that this muse is specific to our culture of grazing and herding livestock, even small scale farming, that once becomes corporate seems to clean the slate and erase a place’s history. I hear the voice of my father on this ground, all the old cowmen neighbors I learned from, as well as their dead fathers, remembering the stories and sayings. I feel their presence here, everyday. What more fertile ground to write from! It does, of course, become part of our spirituality, but in the scope of ‘prompting’ a poem, or any art for that matter, our muses reside in these landmarks. we were gods and the world was ours. coasted off-course, hollers: ‘Where are you? ‘Over here. Over here.’ As we talk. are family, this covey come to share our fire.